Can't Live Without Notions. Discover our current favorites. Julie Hancock - Olfa 45mm rotary cutter ($17.99). Always have a sharp replacement blade at the ready! Karen Averett - Currently working on the latest Lori Holt Sew Along, has found the Frixion Pen ($3.49) to be essential. Use it for marking fabric then hit it with an iron and, voila, gone! She's also loving the Wooly Felted Ironing Mat (19.99 for small) for pressing beautifully flat seams. Stacey Giles - LOVES the Needle Nanny ($12.99) by Quilt Dots. You'll find her wearing it at the shop to hold pins. They'll hold up to 4 lbs so you can even keep little scissors handy! Emily Herrick - Stringblade ($9.99 for 3) coming soon to Corn Wagon, is a new little thread cutter with an adhesive backing so you can attach it to any sewing surface. Jen Tanner - Seam-Fix seam ripper ($6.99) Stays sharp for years and has a rubber end that "erases" threads. No, really! It grabs those pesky un-picked threads and pulls them right out of the seams. It comes in a mini travel size ($3.49) that's a must have! Chris Chamberlain - The Purple Thang ($3.99) is a multi-use tool that she highly recommends to turn machine applique pieces right side out. Suzanne Adams - "Cheater" glasses - that's what she calls her favorite Scojo Reading Eyewear ($39.95). They're so light weight and excellent quality! Marianne Michaels - Perfect Scissors by Karen Kay Buckley ($21.99 4") have knife-edge blades and are sharp to the point making them ideal for cutting wool applique pieces with precision. 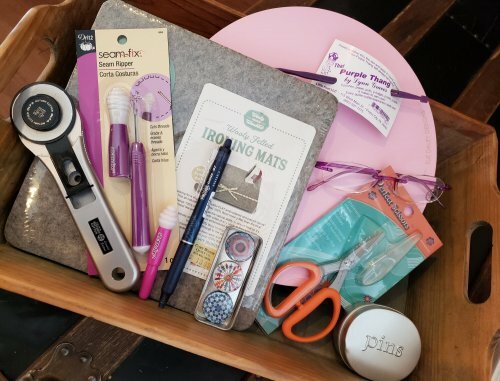 Marsha Harward - Pink Rotating Cutting Mat by Sue Daley ($36.99 10") allows you to square small blocks lickety-split since you'll only have to align your ruler once then rotate the mat to square all sides! We just happen to carry all of these notions and many more here at the shop. We're very selective about the tools we invest in and only stock items we use ourselves. Stop in and ask one of our employees to show you how we use our favorite notions. As always, we would love to hear about the gadgets you've found helpful so we can give them a try! Marsha just picked up a whole bunch of fun notions from Riley Blake! 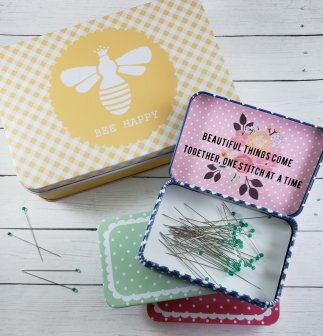 We especially love these cute tins. The large tin is big enough to hold scissors, marking tools, small templates and more. It comes in three happy colors, each with a different message. The small tin has a magnet in the bottom and makes an excellent pin box! It comes in five colors. Open the lid to find a unique sewing thought! 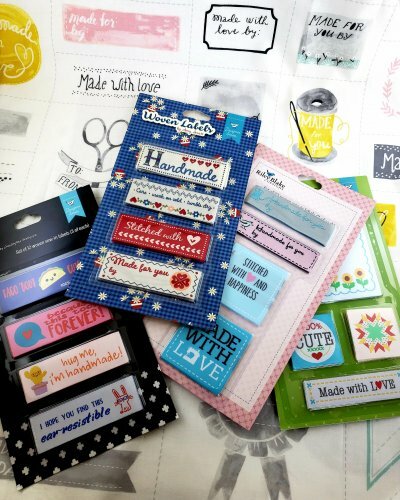 Great little gift items for your sweet sewing friends, they're going fast! A notion often neglected; quilt labels! We have the best intentions of adding a label to each quilt but let's face it, by the time we finally reach the end of a project, we're just so excited to be finished and that label idea is left behind. We recommend having a few pre-made labels on hand to make adding that important bit of quilt documentation fast and easy. Labels printed on full-width fabric by the yard means you'll have a variety on hand when you need them. Or pick up a package of darling labels designed by your favorite Riley Blake artists. Either way, you'll be so glad to attach that final touch to each quilt. Keep an eye out friends! 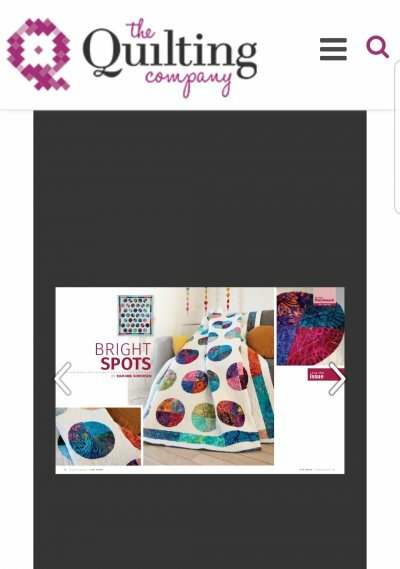 Our Ramona has another quilt design in a publication! Visit The Quilting Company's website here for a sneak peek at their Spring 2019 issues hitting newsstands March/April! When you find Bright Spots, that's her! We consider ourselves lucky to have such a talented quilt artist as part of our team! We're still making Monday, well... Marvelous by offering a discount in one of our departments but we're adding a little extra excitement! In addition to our regular Marvelous Monday Sale (Monday, February 11th - 25% off Minky & Cuddle Fabrics!) 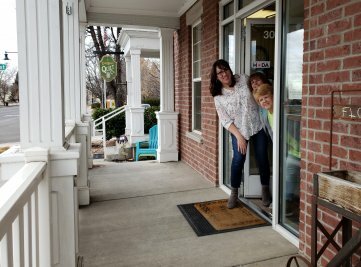 we want you to stop in and find out what's on the porch! We will be giving a hint each Monday morning on our social media pages (follow us on Instagram & Facebook!) but you'll have to come in to find out what item we have on the porch at an extra deep discount! It could be a favorite notion, new book or even a whole line of fabric! So join us for Marvelous Monday on the porch! Please Note: The Sue Spargo Fresh Cut gathering and It's All About the Wool Club will meet Tuesday, Feb 19th at the regular time, instead of Tuesday, Feb 12th.